Test center helps a mining company select the correct mill for a new installation. When it comes to size reduction, having the correct mill is crucial to ensure a high-quality end product. 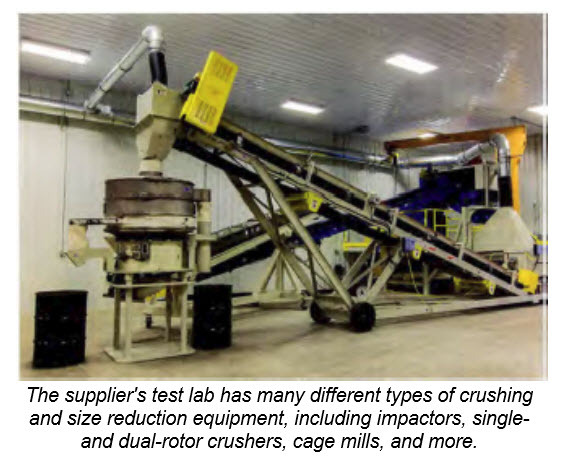 While designing a new line to process agricultural lime and feed supplements, Wake Stone Corp., a mining company based in Knightdale, NC, which specializes in construction and agricultural materials, needed to find a mill able to provide a consistent particle size and quality. The new mill was needed at Wake Stone's North Myrtle Beach plant, which also has a limestone aggregate crushing and screening operation. Wake Stone's current facility was designed and constructed in 2001 and an agricultural plant was added in 2011, but the company has been operating in North Carolina since 1970. This longevity has been achieved with the philosophy of doing things the right way the first time when designing and building a plant in order to save money down the road, as well as having a spare part for many critical components in the plant. This mindset meant Wake Stone needed to thoroughly test and evaluate a number of different milling options before purchasing one. To find a mill that would fit its goals and material, Wake Stone turned to Stedman, a size reduction equipment manufacturer based in Aurora, IN. The supplier has two testing and toll crushing facilities to evaluate customers' material and figure out which piece of equipment is best for each application. "Working with Stedman's test facility was a great experience," says Jared Miedema, director of engineering for Wake Stone. "Their testing technician helped us with a variety of mill feed gradations, giving us insight as to which mill would work the best." Most of the size reduction equipment testing takes place in the supplier's main test facility, while most toll crushing is done at another, recently expanded test facility, although both facilities are used for various testing and toll crushing services. The recently expanded testing and toll processing facility has two horizontal-shaft impactors and other full-size equipment including cage mills, vertical shaft impactors, hammer mills, and lump breakers. Open- and closed-circuit and air swept systems can be used for pre­purchase testing, process development, and toll processing. Each machine can test the client's material at different speeds to ensure the right particle size reduction requirements can be met while keeping up with production demands. The supplier also performs material tests, including moisture content analysis, particle size distribution analysis, bulk density analysis, abrasion tests, and more to ensure the right equipment is selected for the material. Wake Stone needed a new mill to use as the tertiary crusher in the North Myrtle Beach plant. 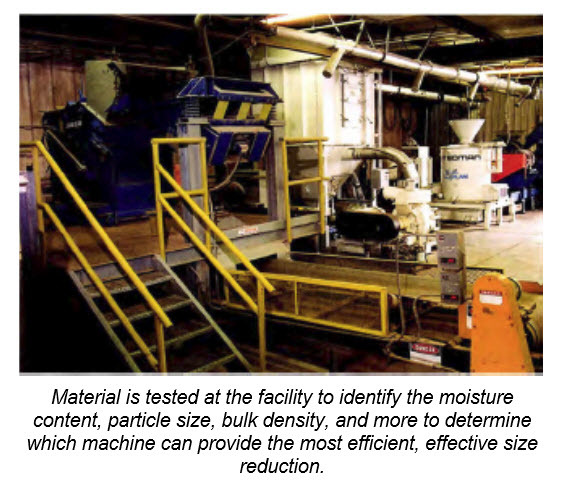 The tertiary size reduction step occurs after the material has already run through the primary and secondary size reduction steps in the aggregate plant, meaning the material needed a final run through a mill to achieve a consistent gradation before being sent through a moisture mixing station. After testing several different mills at the supplier's testing facility, Wake Stone found that a H54 cage mill would handle the material and ensure only particles of a specified size would leave the process. A multi row cage mill consists of a fabricated steel housing that encloses the wheel-shaped cages. Each cage includes a steel plate fitted with equally spaced pins arranged in a row around the cage perimeter. At Wake Stone's new installation, the cage is placed directly after a vibratory screener, and material is fed into the machine off the top deck. As material flows through the cage mill's intake hopper and chute into the innermost cage's center, the adjacent cages rotate in the opposite direction to propel particles. The particles' impact velocity can be adjusted by increasing or decreasing the operating speed of the cages. The cage mill can fully process the material in a single pass when running at full speed. "Once we settled on the H54 model, we also tested different speed configurations, which were very helpful," Miedema says. After installation, Wake Stone found that the cage was wearing unevenly. To counteract the uneven wear, the company installed a slide chute on the feed end to force material farther into the mill, facilitating proper distribution and extending the life of the sleeves. Wake Stone also installed a new hub and plug assembly so that the single unit centers the cages on the shaft to eliminate any misalignment, keeping the cages centered. "We've had ongoing support from Stedman throughout the life of this crusher," Miedema says. "They had a very experienced technician help us during our balancing issues, which proved beneficial."